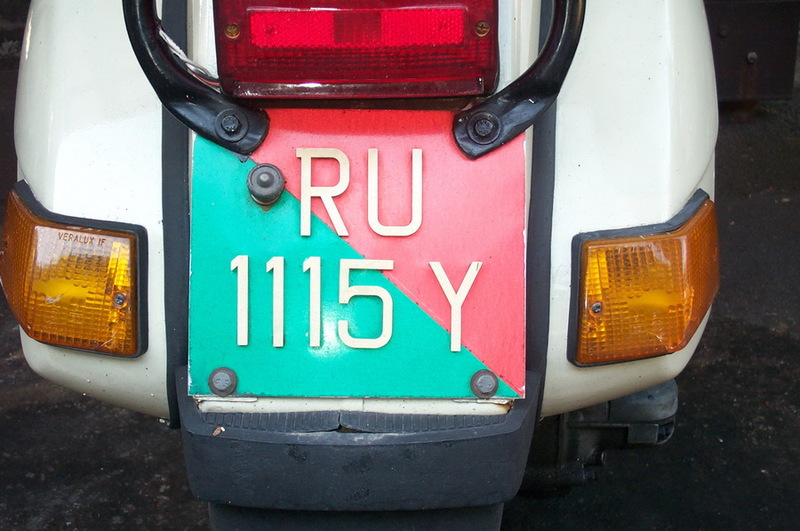 Singapore’s plates continue as shown in RPWO and a wide variety of colours and codes are enough to keep a keen spotter occupied for some long time. Two of the outer islands have been allocated their own plates – Sentosa and Ubin – and these cannot be used on the ‘mainland’ of Singapore. If they must go over there, for repairs etc., they will carry SGP trade plates for the journey. Sentosa’s colourful plates have been known to us since about 1998. 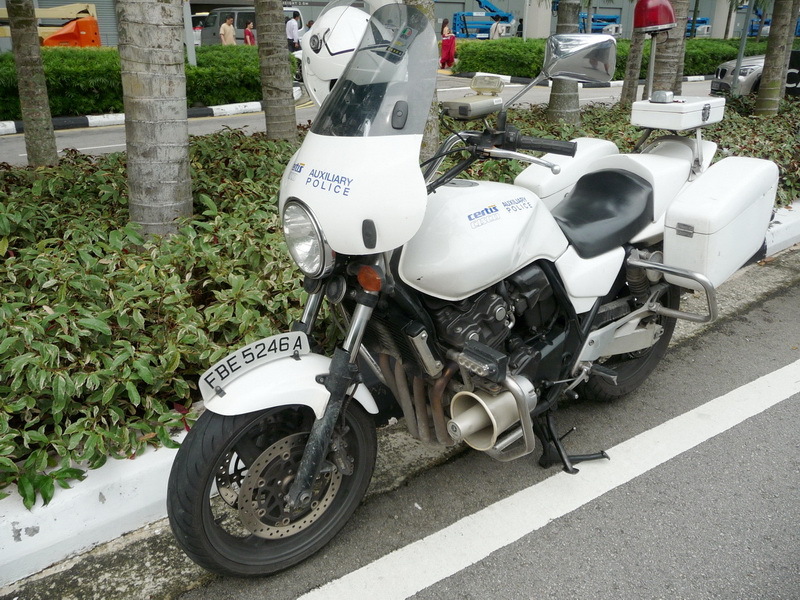 This Vespa RU 1115 Y is one of few two-wheelers registered on Sentosa. Brumby archive 1987. The Sentosa Development Corporation, whatever that is, has a few buses, which are allowed on and off the islet, and have a special SDC code issued! 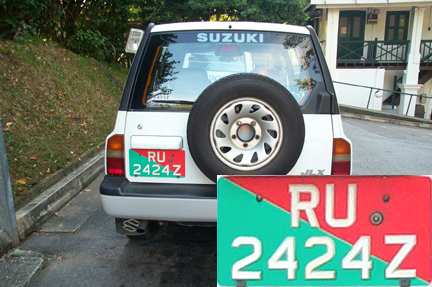 But we have only recently become aware of the special plate colour given to the few vehicles on Pulau Ubin (Ubin Island), which is a mile off the North-East coast of Singapore, by Changi airport. The island is lightly populated by fishermen and kampong farmers and has completely escaped the rapid advance to the six-star first-world status now enjoyed by the Republic of SGP. There are about ten mopeds on Ubin, of which half still work and about 15 minibuses, which carry the islanders and some of the weekend visitors along the narrow island roads to various camping sites and hiking/cycling trails, for which Ubin has become a popular, rat-race getaway. One travels to Ubin by bum-boat, for 3 ringgit ($1US) which takes fifteen people at a time on old vessels which you would not expect to be still in service, but which are the pride and joy of their rough-looking but friendly owners. 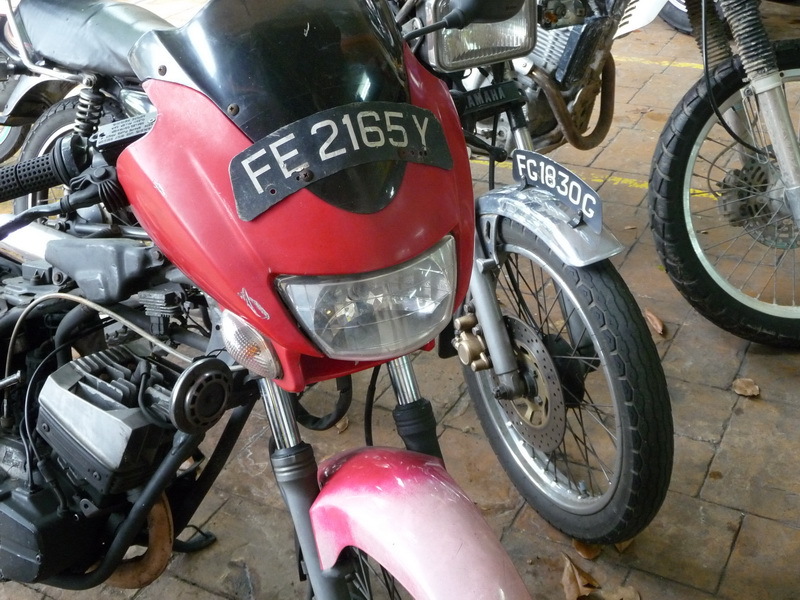 Since registrations started on Ubin, perhaps in 2000, and originally only for a few small motorbikes which had previously run plateless, about 135 total registrations have been made, of which perhaps 15 to 20 remain in use. 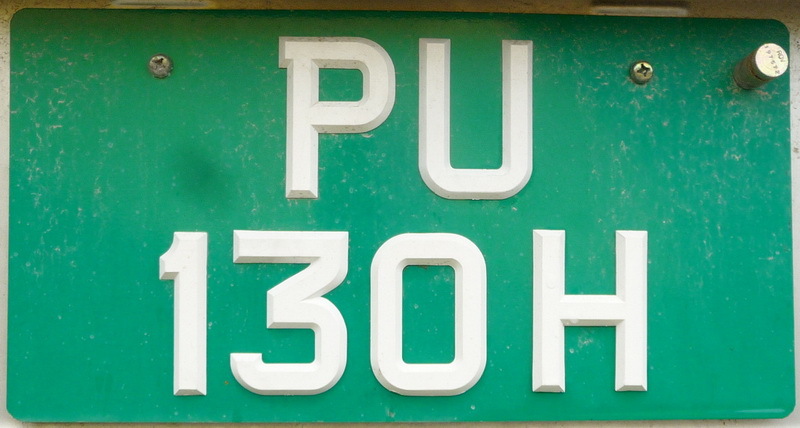 The system is that of the Singapore mainland, using the PU area code, a serial number (current highest 137) , and a check digit, all in white on a pea-green background. 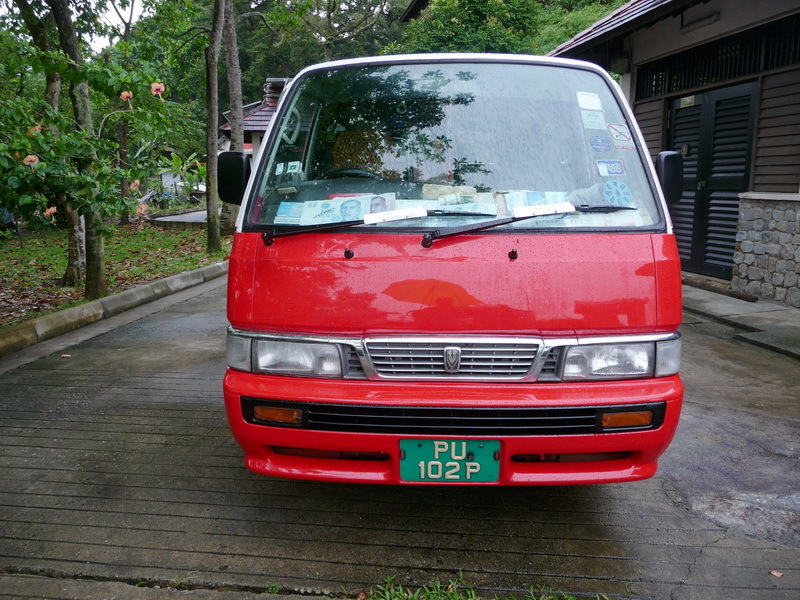 PU 130 H is just six off the highest number on Pulau Ubin, the latest minibus seen, being PU 137. Note that all the plates are properly made, even though this island is quite primitive…. 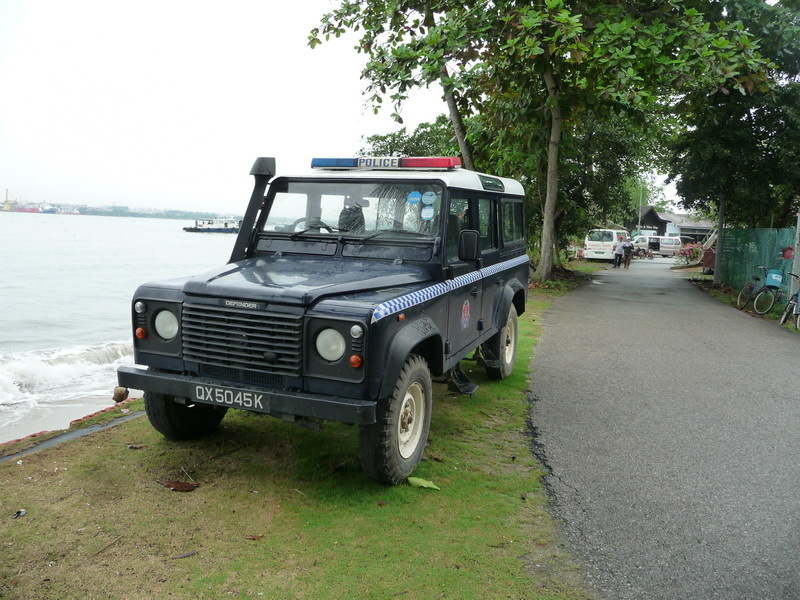 There are a few special purpose vehicles on Ubin, such as Police Land-Rovers and a couple of biggish lorries for construction jobs, and as these are there temporarily, they retain their normal Singaporean plates. 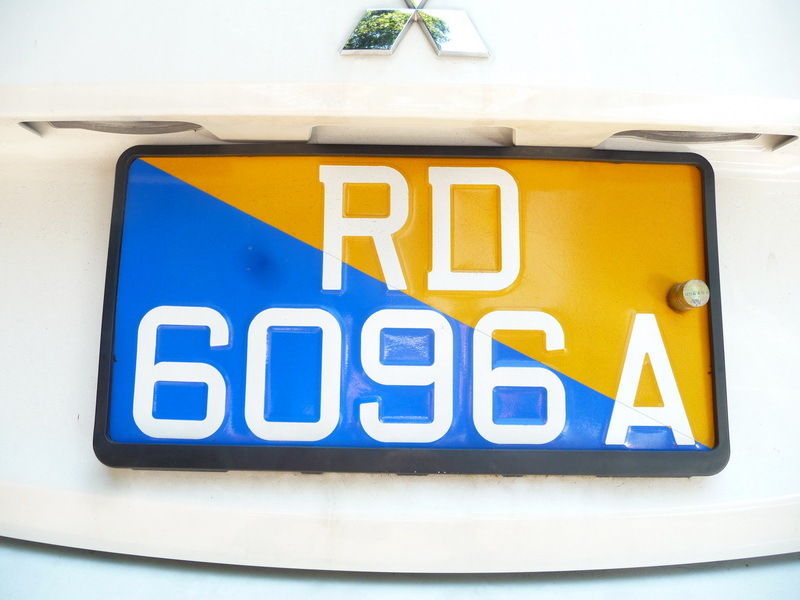 The SGP government is sponsoring experimentation in clean/non-emission vehicles and has allocated a dedicated ‘Research and Development’ numberplate to the handful of cars being tested on the island. 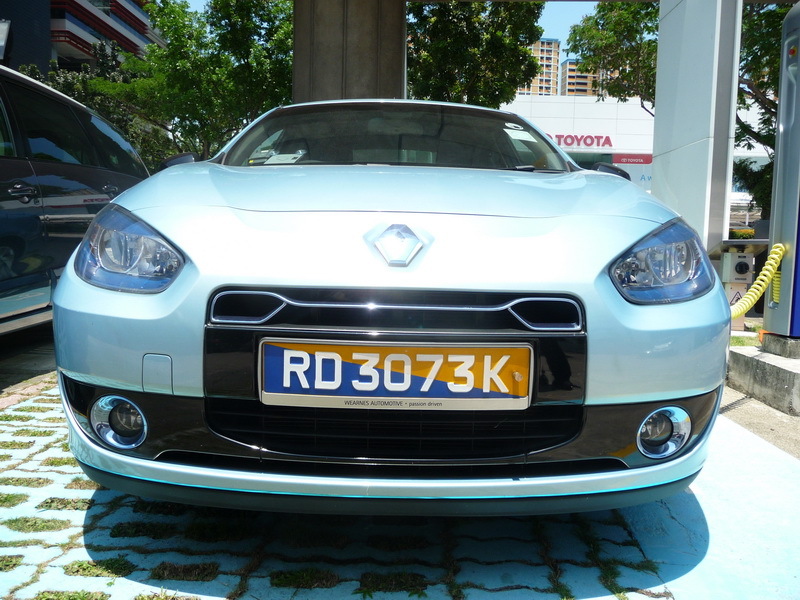 RD 6096 A is carried on a Mitsubishi minicar and has a 100km range, recharging 80% in 20 minutes. It says here. Brumby archive 2013. There may be up to 50 vehicles on test, each of which is connected by wifi signal to a central office, in which its location, performance, battery-condition, range etc is transmitted every 5 seconds for analysis. This category uses such high numbers that they must be split in some way, perhaps the first two or three numerals indicating a code for the few participating bodies in the experimentation. Certainly there are not more than a hundred of these low-emission category vehicles in the whole country, so 6096 seems optimistic…. 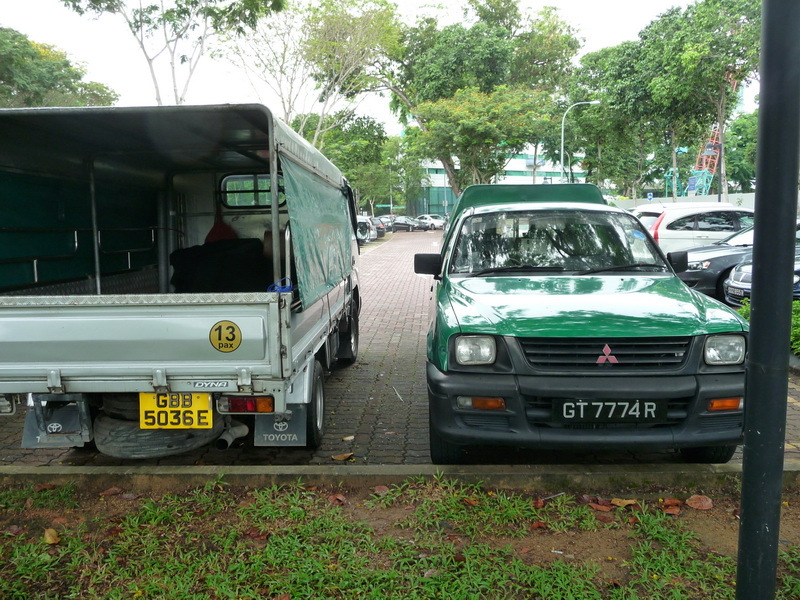 It is of mild interest to note that Singapore vehicle owners can choose for themselves whether they plate their vehicles with the original silver/white on black plates, fore and aft, or Euro-style black on white (front) and yellow (rear). About 20% favour white on black, I estimate. TR – Singapore trailers are now up to TRE, having exhausted TR and TRA to TRD. YM 942 S – Another unusual SGP variant is the recently-adopted orange background to distinguish lorries which carry hazardous cargo, such as fuel and chemicals. These cannot enter tunnels and need to advise police and fire when they plan to access certain zones of the island. The Y starter letter tells us that the truck exceeds 3 tonnes unladen; the M is serial. Brumby archive 2007. 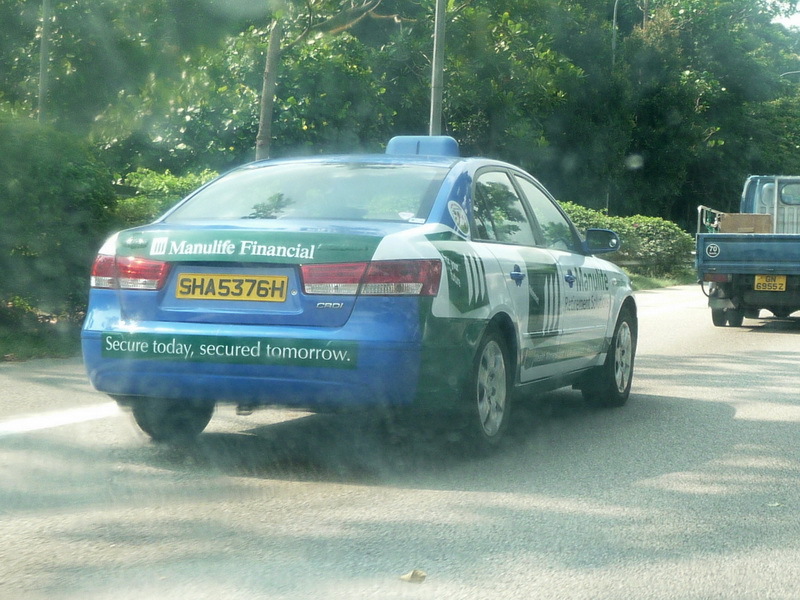 SH – Taxis have progressed to SHA, SHB and now to SHC. SHA 5376 H is the Singapore Hire code with suffix serial A, on a typically smart, clean, new car, a credit to the taxi fleets. Brumby archive 2013. New private cars are up to SKJ, having jumped SH (kept for psv’s) and SI (‘I’ never used) and having presumably used up SJA-Z (though not seen). 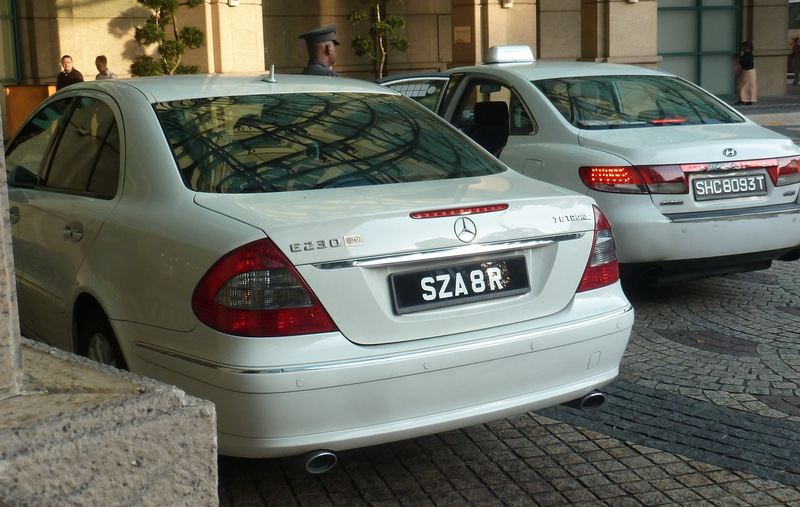 A very rare sight in Singapore is the semi-diplomatic plate allocated to foreign technical aid personnel. 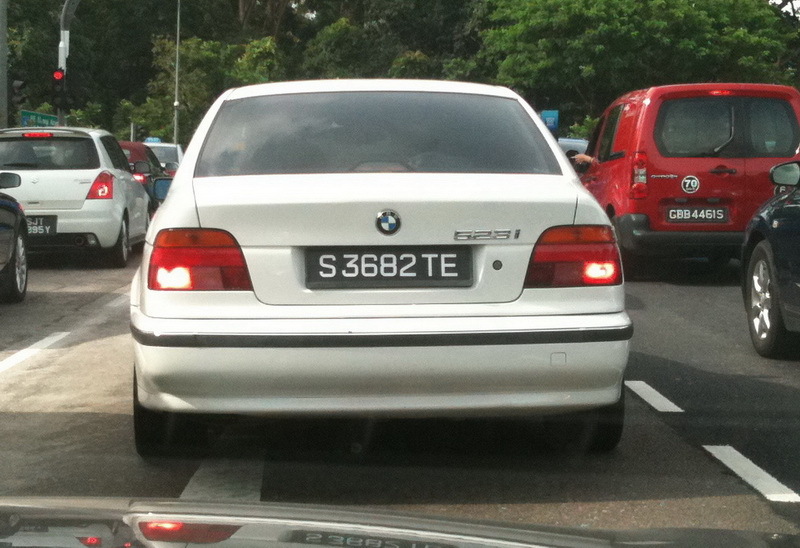 TE is the suffix code for these ‘Technical Expert’ vehicles and this BMW 525 example is coded 36 for the Philippines. The Consular Corps variant is also hardly-seen, but Taiwan had code 66 in this category (photographed there in 1993, so possibly not current). Taiwan’s foreign-mission code 66 seen on a Volvo 240, given Consular, rather than Diplomatic recognition, presumably due to pressure from PRC to sideline the Formosa territory they vainly hope to recover some day. Brumby archive 1993. Motorcycles exhausted their two-letter FA-FZ prefix codes some time ago and current registrations, for every size of 2-wheeled bike, has re-started from FAA….. Note that, against the trend, SGP still requires a front plate to be displayed, either double-sided along the front mudguard or a forward-facing plate adhering to the faring. 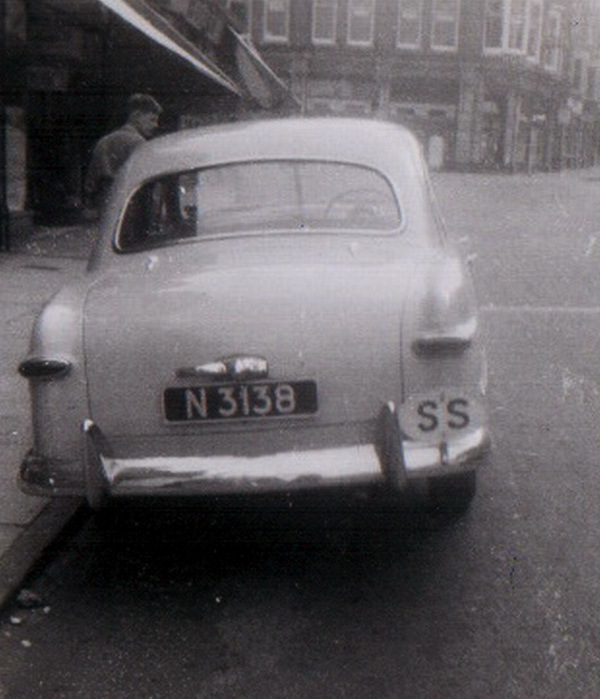 There is an auxiliary police force,it seems, but they use normal private m/c plates, as FBE 5246 A. Brumby archive 2013. 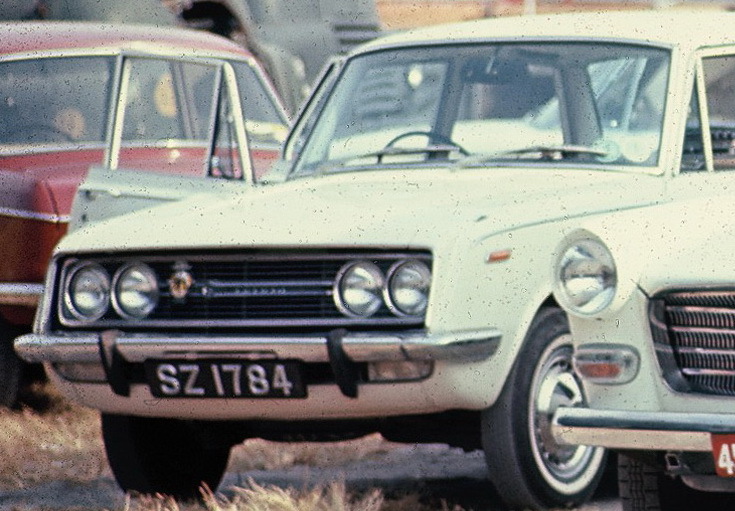 The author’s first visit to Singapore was in 1966, when the vast majority of the vehicles were made in Britain, from motorcycles to double-deckers. I still enjoy finding the leftovers from that period and recognise that many owners are very proud of their cars, which are now collectors’ items! 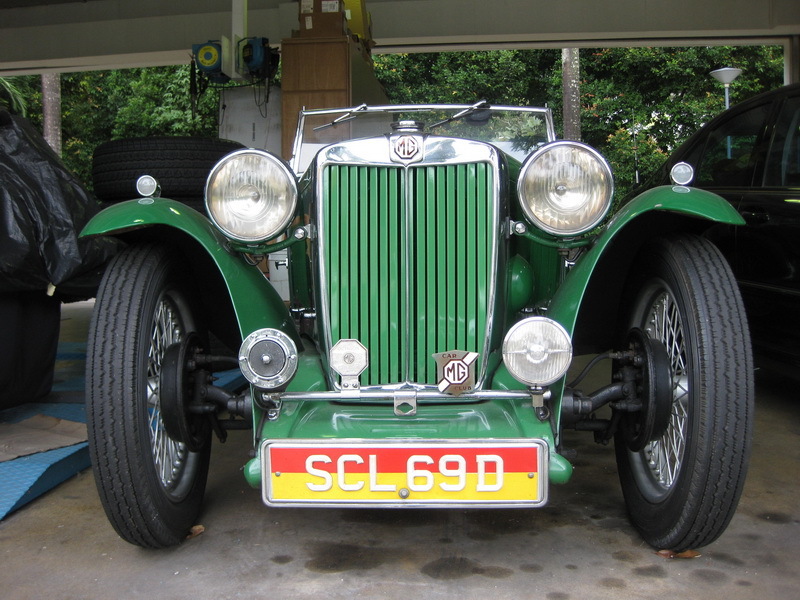 A well-restored MG TC(?) sporting the special, low-tax plates of the approved vintage and veteran cars and bikes in Singapore. 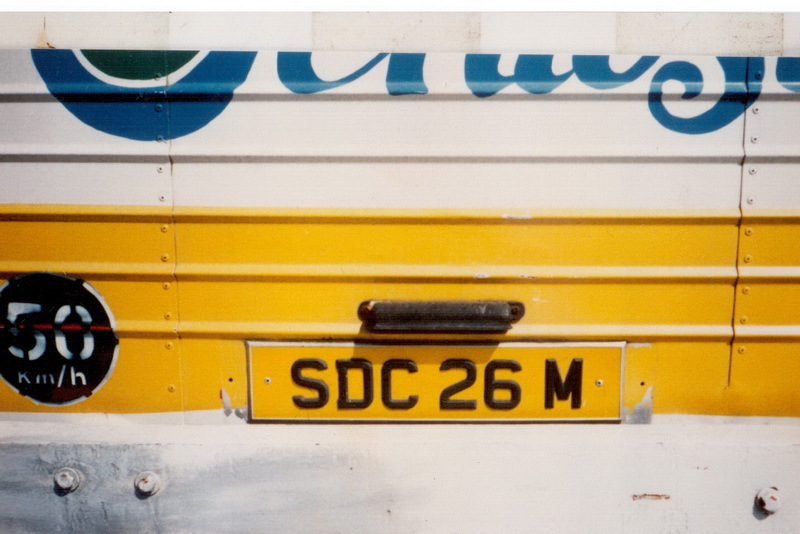 SCL 69 D is a normal registration issue, and it is the plate colouring which gives the privileged status. Brumby archive 2008. SS 9806. 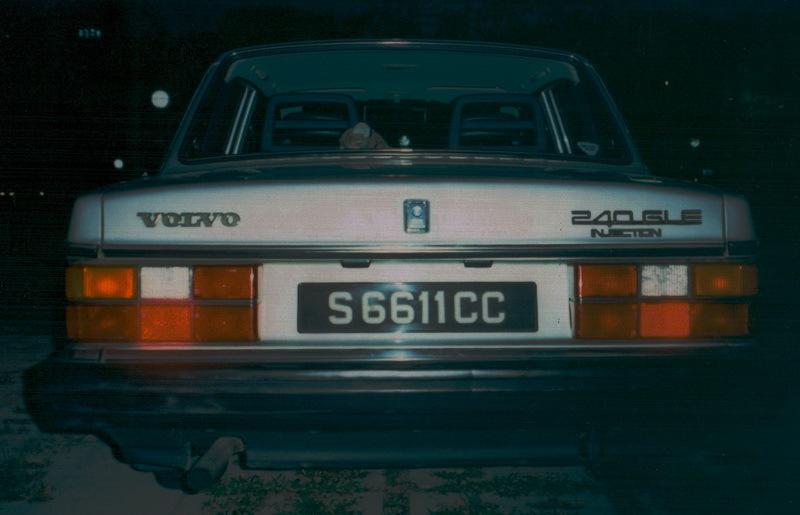 A plate from the former series. 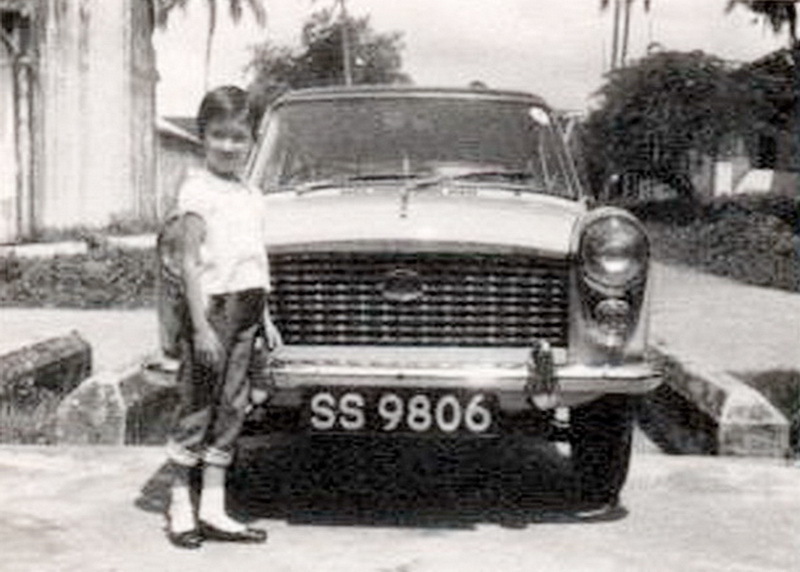 About 1960, many British Army, Navy and Air Force personnel served in Singapore and it was a period of very many new registrations, as most of them purchased a car there – (or duty-free at home, to take out and register there). 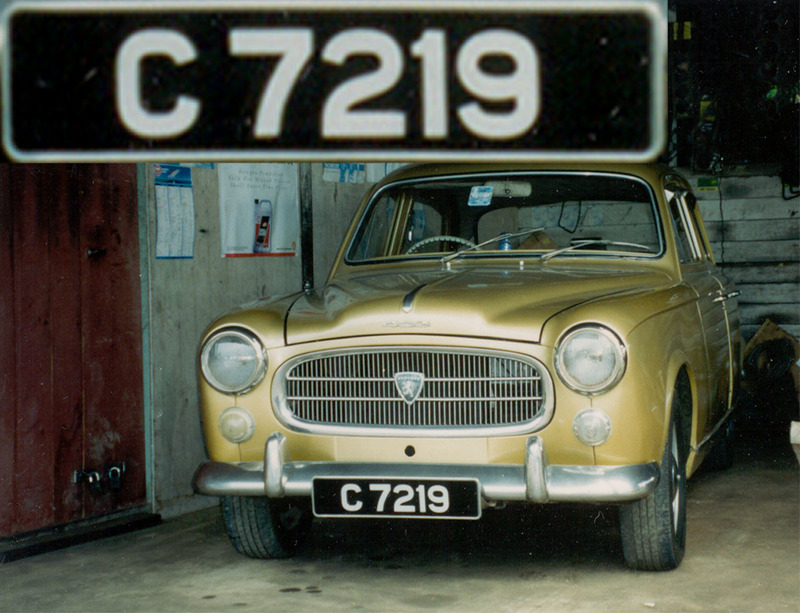 This Austin A40 Farina belonged to a Wing-Commander, whose daughter June, modelling here, now dwells in Ottery St, Mary and makes jam for the Womens’ Institute. Brumby archive-June Harvey. Finally, a photo which has materialised recently is certainly worth display. 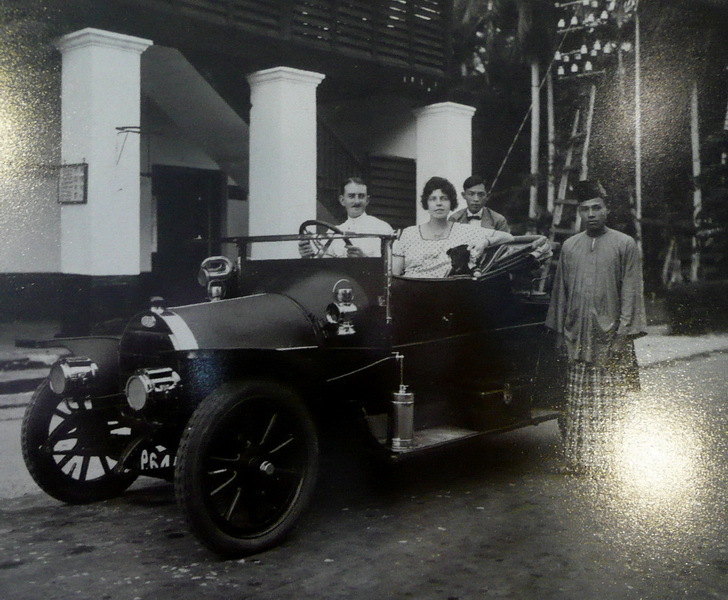 Here is Singapore’s eighth car looking as if it had just come off the ship from the Britton* motor factory in England. Unusually for a British territory, Singapore used a dash or dot separator from inception to the mid-1930s; S-8 favours the dash. The driver was known in those times, out east, as a syce – an archaic term for a horse-carriage driver/groom, which carried on into the age of the car. 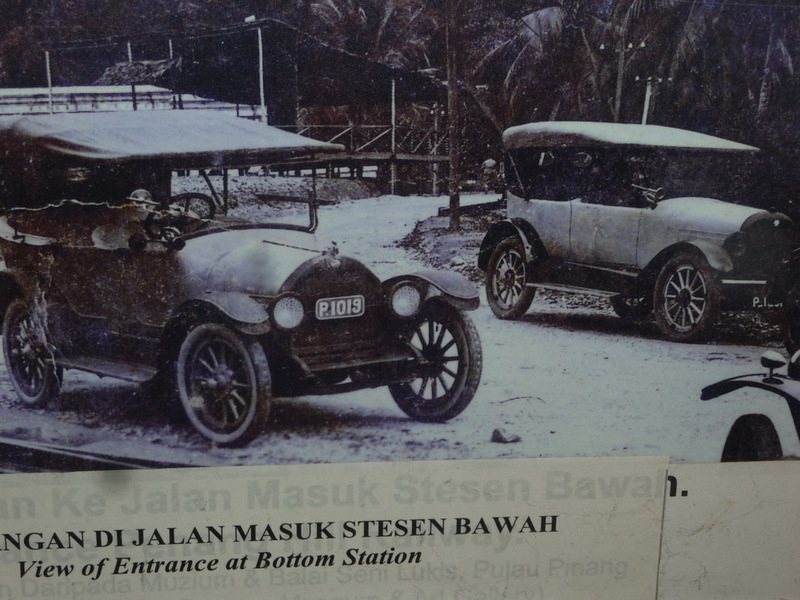 *I can find no reference to the Britton marque after a quick search……..
S-8, a Britton, among the very first automobiles to reach the Straits Settlement of Singapore, in 1911. (No details seems to survive of this marque.) anon. Double-tap the picture to enlarge. This amazing 1936 shot of FOUR PK-registered sports cars in Perak State illustrates the 1932-48 series as used in then-unfederated Perak (and Johore, Kedah, Kelantan, Perlis and Trengganu). Each was allocated its own International oval, too! 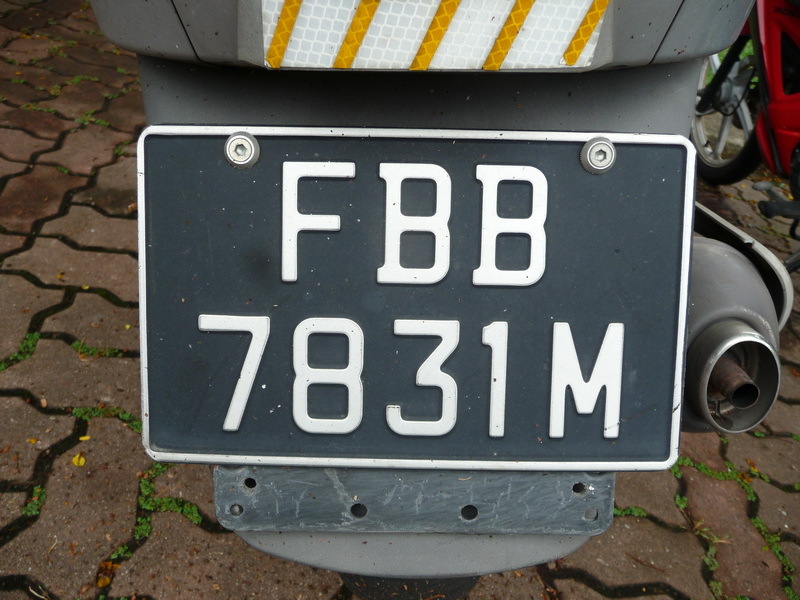 The Federation of Malaya revised these States’ codes to single-letter forms, in common with the Straits Settlements P-Penang, S-Singapore, M-Malacca and L-Labuan, and standardised the International Identification Code to FM. Today we are unlikely to see a Malaysian plate from the former series, which used single letters to code the areas of Malaya from 1948. 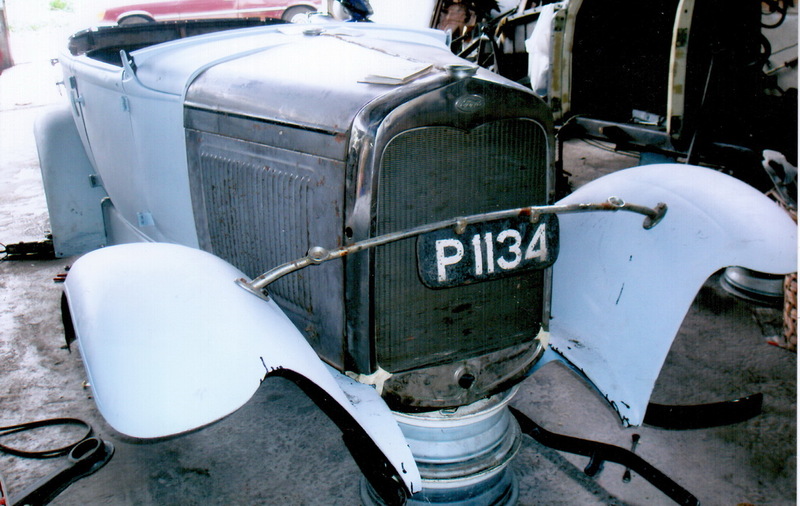 Some collectors’ cars exist such as A 845 below, which have somehow held on to their original registrations and a handful may be in museums, such as C 4848 on a swb Land Rover fire tender in the palace museum of the sultan of Pahang. The construction/design of these plates was as determined by the Construction & Use Regulations of the United Kingdom, in common with most of the British overseas territories. Here are examples of all the original single-letter plates, in photos taken from 1920 (P 1019) to the last seen in 2010 (B 2565). 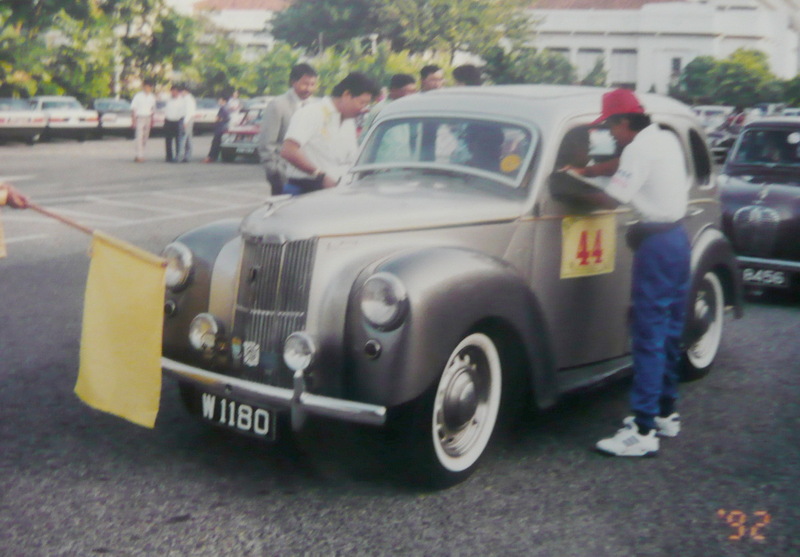 A – Perak state, on a 1935 Morris Eight tourer. 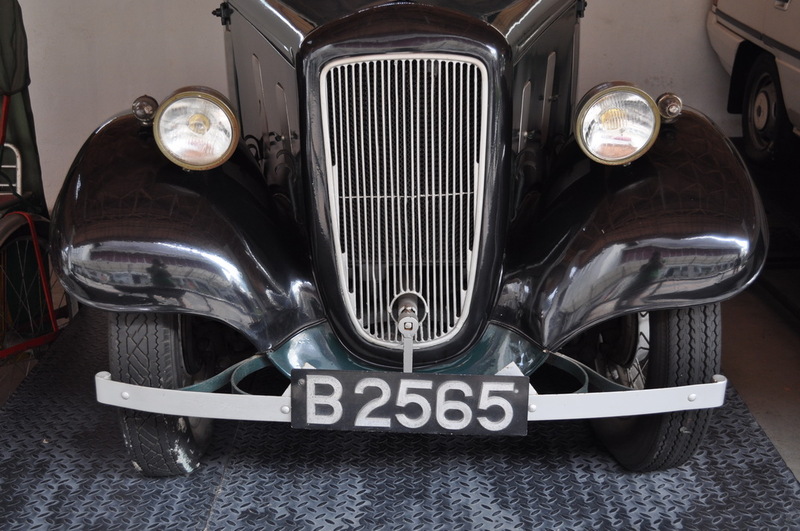 B – Selangor state, on a 1930’s Austin Seven at the National Museum in Kuala Lumpur. 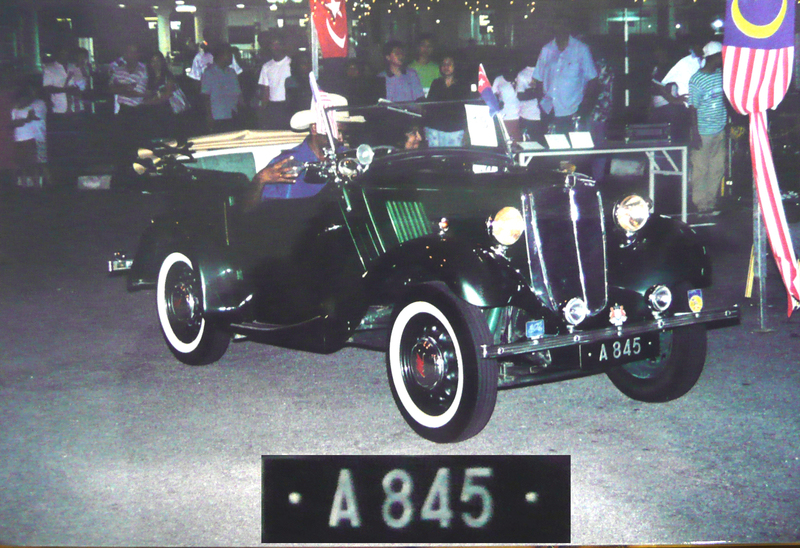 This 1935 car would have originally borne the SL prefix for Selangor state, and would have had to change to the new ‘B’ plate in 1948. 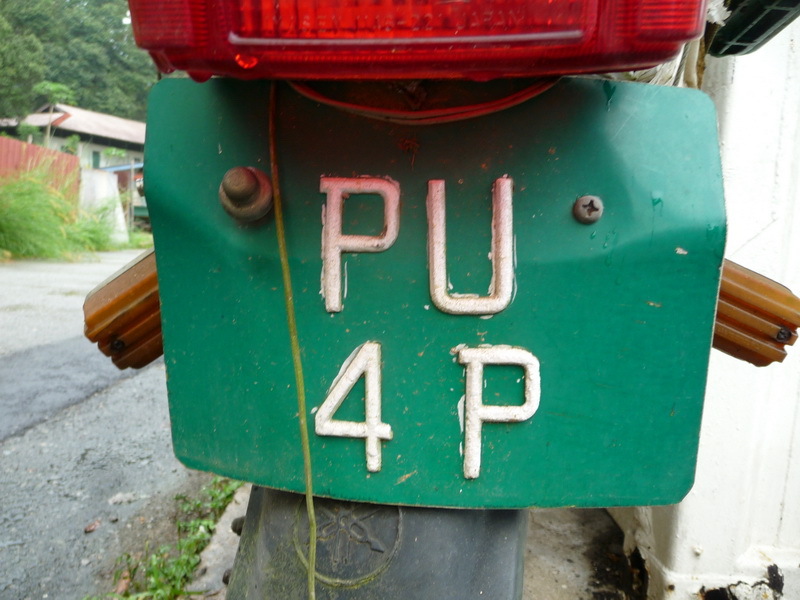 C – Pahang state, on a 1950s Peugeot 403. 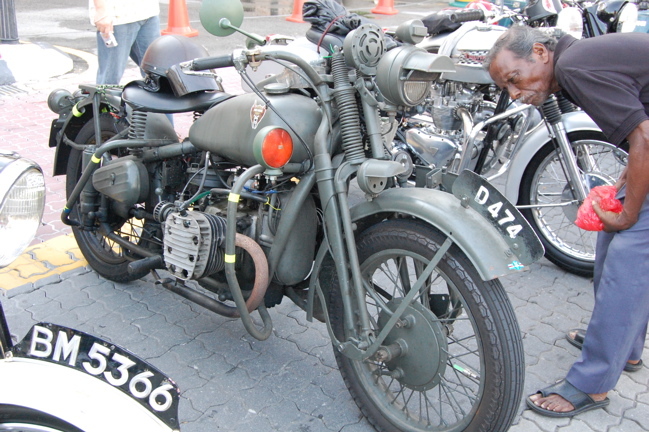 D – Kelantan, on a restored motor-cycle. 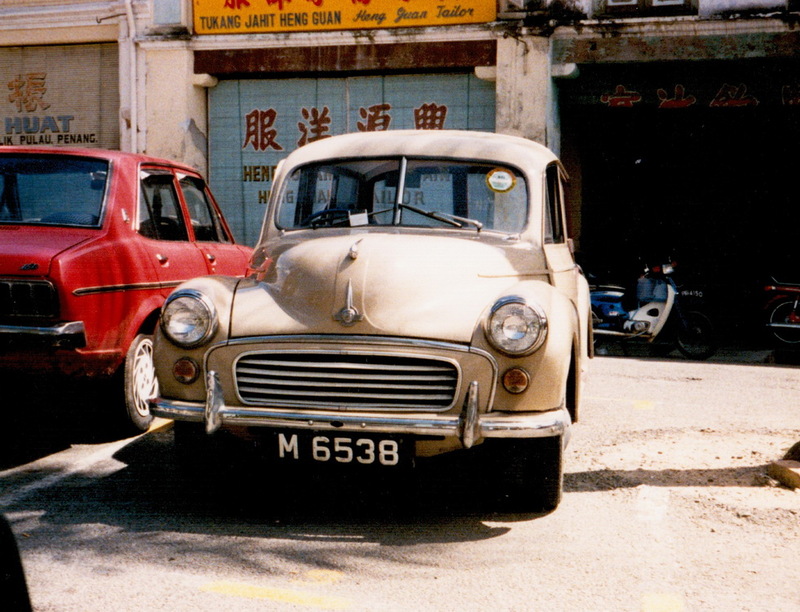 E was never issued as a Malayan code, nor F, G, H, or I. H played a part in the plate scene however, as it has been used as a suffix and a prefix to the area codes, to denote Hire – both local and long-distance taxis. For additional ease of identification, theses plates have always been black on white. 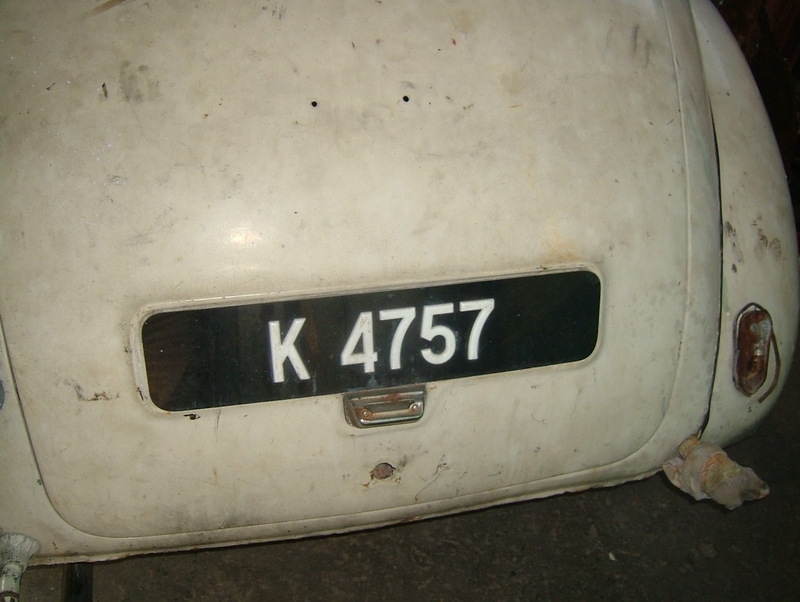 K – Kedah state, on a Morris Minor. 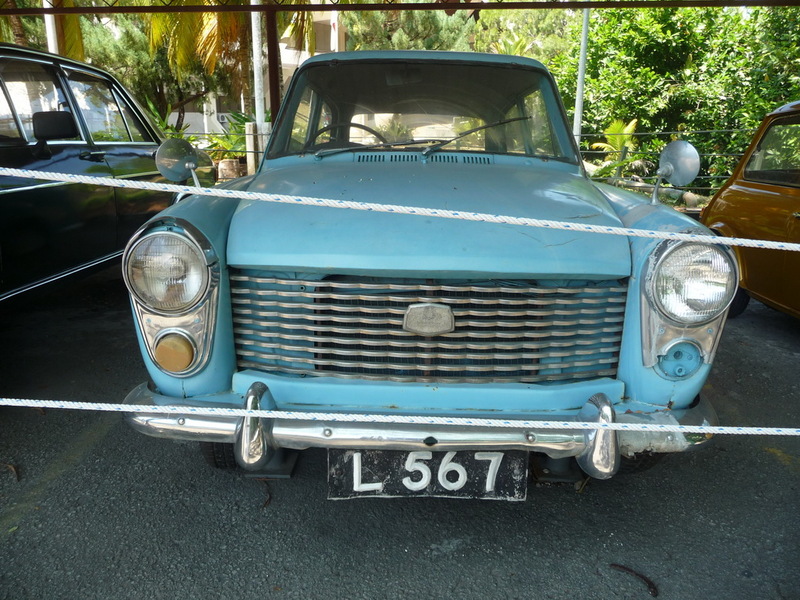 L -Labuan island, on an Austin A40 Farina, preserved (?) in the state museum in Kota Kinabulu, Sabah. L was issued to the island in 1906 when it was one of the five Straits Settlements (with Singapore, Penang, Province Wellesley and Malacca) until 1946 when it was made a part of British North Borneo with no change to its plates. L was evenyually supplanted by EL in 1963 when the island became part of Greater Malaya – or Malaysia. 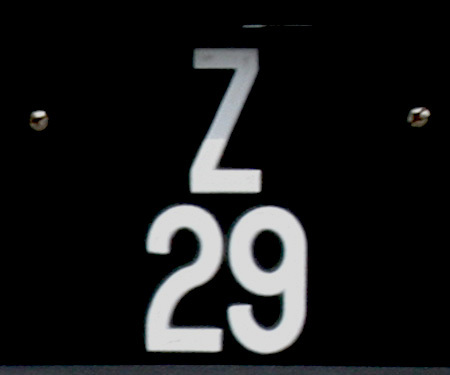 Because North Borneo (now named Sabah) and Sarawak had already been using many regional codes which were common to some regions of mainland Malaya, the additions of ‘E‘ indicating East Malaysia and of ‘Q‘ for Sarawak were designed to prevent duplication of registrations when/if vehicles moved between Borneo and the mainland. Over the years, Labuan’s international oval has changed from SS to CNB to PTM to MAL! 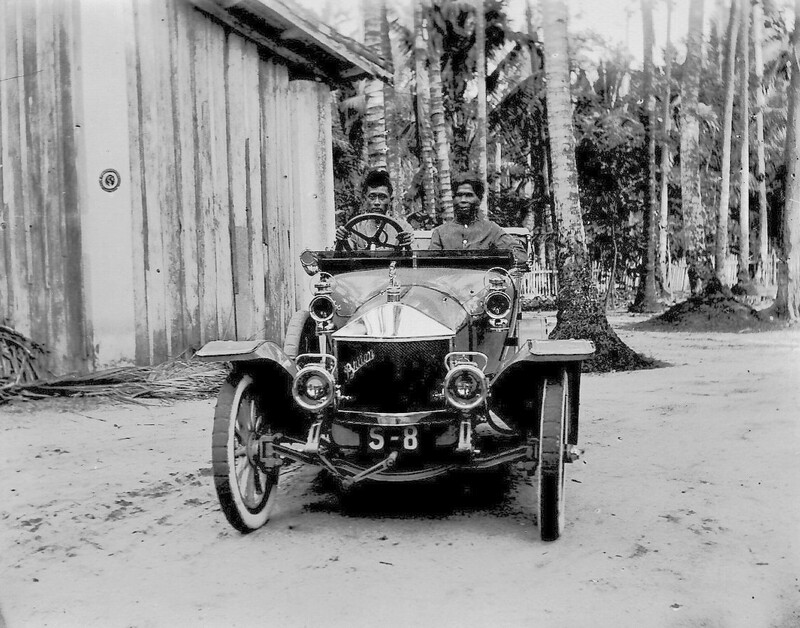 P 1019 – Penang island, in the 1920s, when administered as a Straits Settlement and using the same registration system as mainland Malaya. 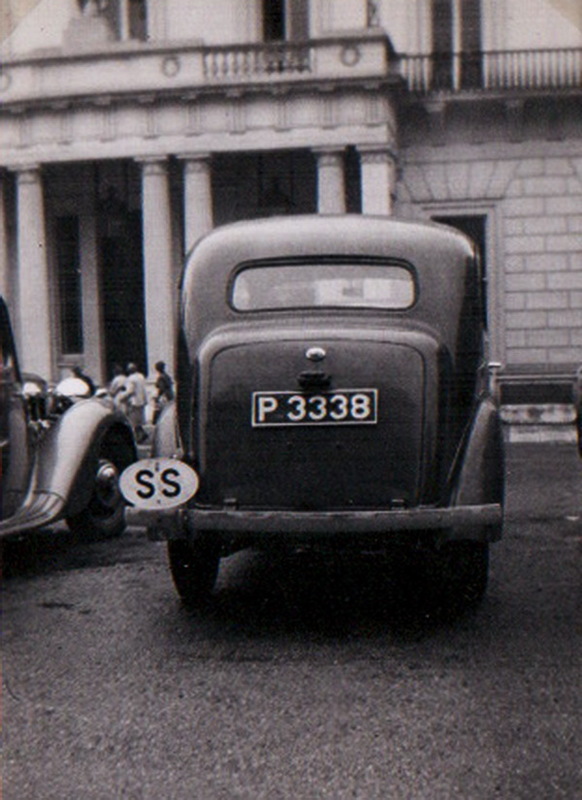 P 3338 – Ford Eight from Penang, Straits Settlements, seen in London in the 1940s, A rare shot with the SS oval displayed. O was never issued, nor Q, U,V, X or Y. Z is reserved for staff cars for senior military officers. R is the state code for Perlis but we have no on-car photo yet. Too good a shot not to include Singapore’s eighth car in our single-letter article! Thought to be 1911. S was the code for Singapore when it was a part of Malaya. 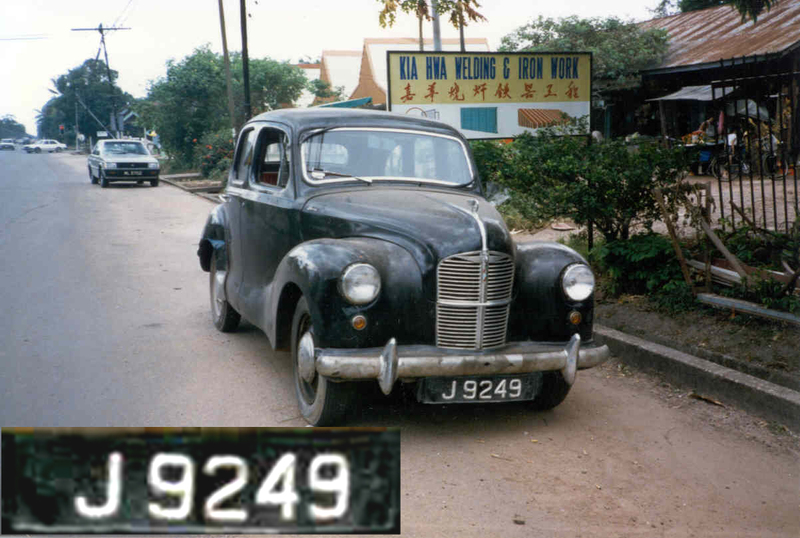 At 1965 secession, S plated vehicles living over the causeway in Malaya had to change to local Malaysian registration, and lose their ‘S’ plates. 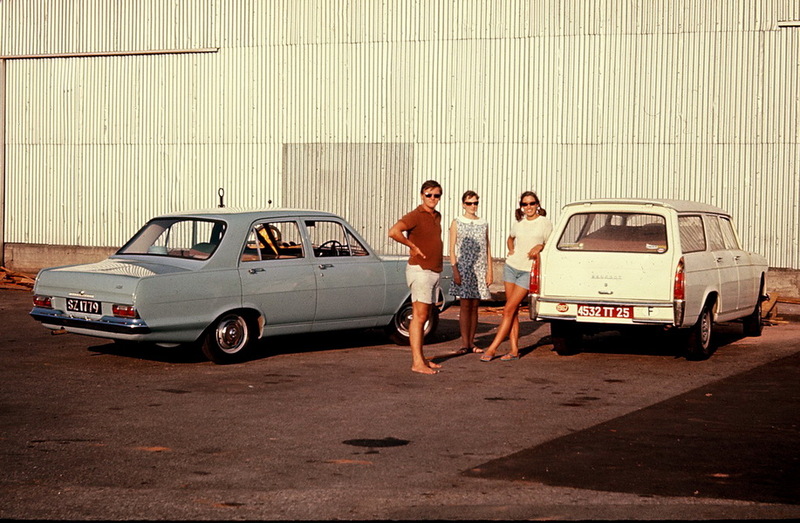 T was for the state of Trengganu, for which we have no on-car plate picture – unless YOU know of one! W – was allocated originally the code for Province Wellesley, the mainland component of Penang and discontinued in 1957, to use the P code instead. 17 years later, in 1974, W (only with serial suffix letters A and on) was re-issued to Kuala Lumpur autonomous zone, (the Wilaya). Some new vanity plates are appearing with the single-letter W code, which seem dubious in their authorisation. Anon. Z is a post-independence letter allocated to senior officers of the armed forces in Malaysia. VB archive. 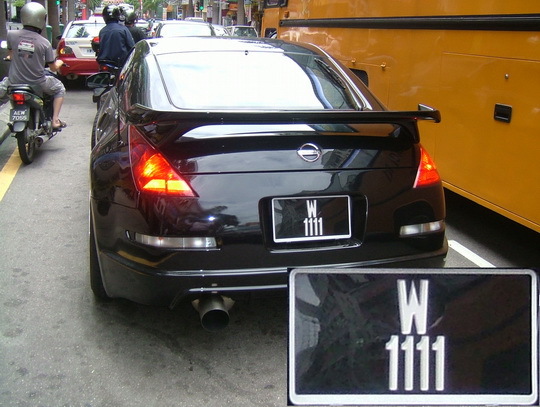 We will inspect the trade plates and the two taxi types in later Pages on Malaysia. Will sharp-eyed viewers note the apparent error in this picture of N 3138? The Straits Settlements were originally named for the coastal enclaves ceded to Britain by the sultans of the independent states of Malaya – lands facing the Straits of Malacca, in the Bay of Bengal. N was the code for Negeri Sembilan state from 1948, (from 1932 it had been NS), when all the states of Malaya combined to form the Federation of Malaya (international oval FM.) Thanks to EU83 John Henderson for this historic picture/puzzle. Q. Is this a German-built Ford Taunus 12M (built from 1952)? Negri Sembilan N 3138, in Harwich (GB) during the early 1950s. 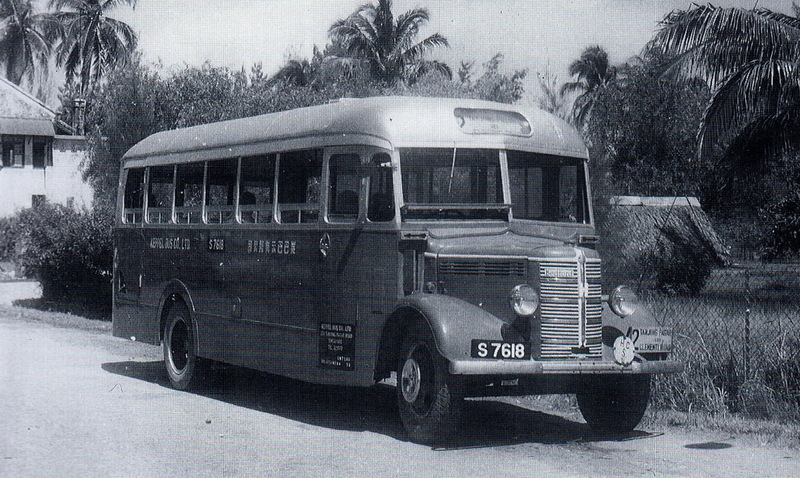 The rare SS oval is shown twice in the Pemberton album, this second one being from Penang island, and seen in London, probably 1949. An MG YA is parked alongside, built from 1947. 1939 Ford E04A Anglia from Penang, Straits Settlements, in London, 1940s. You are currently browsing the archives for the Straits Settlements category.